Joel Osteen has 1 media appearance. Joel Osteen discusses Every Day a Friday: How to Be Happier 7 Days a Week. 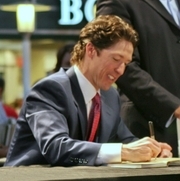 Book Signing: Joel Osteen, Break Out! This event will be a book signing only. Pastor Joel Osteen will not be making a presentation or answering questions. Each couple attending the signing must have a copy of Break Out! : 5 Keys to Go Beyond Your Barriers and Live an Extraordinary Life purchased from Greetings & Readings. Pastor Osteen will not be able to personalize books, nor can he sign personal items or memorabilia. Numbered line tickets will be available in-store beginning at 10 a.m. on Thursday, November 14, for those with a receipt for Break Out! from Greetings & Readings. The line forms at 6 p.m. This is a ticketed event. Tickets are $21.99 +tax per person & include one (1) copy of I declare. Tickets can be purchased at Vroman’s main store, Will Call department and Vroman’s Hastings Ranch. If any questions, please call (626)449-5320. Author will be signing copies of I declare and with that will allow one additional item. No personalizations. Photos & video are not permitted. Joel Osteen signs Every Day a Friday: How to Be Happier 7 Days a Week. Joel Osteen signs Become a better you journal : a guide to improving your life every day. Joel Osteen is currently considered a "single author." If one or more works are by a distinct, homonymous authors, go ahead and split the author. Joel Osteen is composed of 2 names. You can examine and separate out names.